Interesting. My Cousin has a Wii and I'll tell him about this game. It looks pretty fun and I haven't enjoyed a good puzzle game in a while. if you pirate a WiiWare game a Miyamoto robot flies to your house and yells at you angrily. It's quite unpleasant and not worth the trouble. Cammie Dunaway will make you repent. 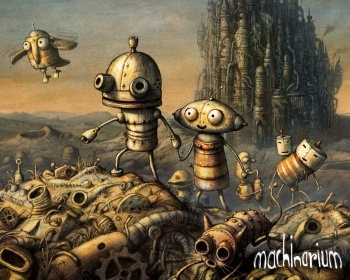 Machinarium is fun, clever, and has tons of style. I recommend it to anyone. I didn't get the game myself, but it's always nice to see something go cross-platform. Well that's great. It really is a brilliant game IMO. It's nice to see WiiWare being graced with some good titles, the lack of the Wii's rendering power shouldn't mean that it can't have great titles. Im surprised more 2D games haven't taken to the platform. Well, PC games like World of Goo, And Yet it Moves, Tales of Monkey Island and such all got WiiWare versions and there are also a lot of great exclusives like the Bit.Trip series and Swords and Soldiers. Cool, already bought Machinarum for my PC, but might as well get it for the Wii too, it was a really excellent game. People may have also pirated it in Europe due to the "PC or Mac" issues it had that had largely gone unreported. I played the demo of this, and it looked like it would be quite fun. You're going to make me buy another PC game twice, aren't you? I just bought PvZ on Xbox, damn it! Now I have to buy this again on Wii!